Par boil the potatoes and peel them. Dry roast the ingredients for the masala till slightly brown and fragrant. Cool and grind to make a slightly coarse powder. Once the cumin seeds starts to crackle, add potatoes and fry on high heat till slightly browned from all the sides. Add the ground masala, dry mango powder and salt and fry for a few minutes on low heat. Sprinkle lemon juice and coriander and mix well. 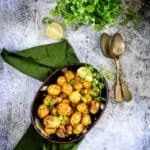 Enjoy cooking Masala Baby Potato Roast Recipe from WhiskAffair. Try more authentic tried & tested recipes from https://www.whiskaffair.com.